A speech was made by American President Harry S. Truman to the U.S. Congress on 12 March 1947. In this speech he said he thought that The United States should help Greece and Turkey to stop them being 'Totalitarianists' although he meant Soviet Communism. This became known as the Truman Doctrine. Some Historians believe that this was the start of the Cold War. This speech was made after The United Kingdom said that they would stop helping Greece and Turkey in February 1947 since The United Kingdom was also poor after the cost of World War II. 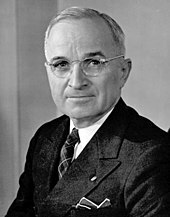 This meant that Greece and Turkey would still be poor and Truman believed that a poor Eastern Europe would convert to a Communist government more easily unless helped by The United States.Truman wrongly thought that the Soviets were helping the Greek Communist partisans when there was no clear proof. This plan was a big change to American politics. Political historian Walter LaFeber wrote that 'the doctrine became an ideological shield' which means that he believed that The United States used the doctrine as an excuse or reason. The Marshall Plan came after because of this. This page was last changed on 16 September 2018, at 04:08.